These legs were made for swimming! Flock to bold, colorful swim fashion of the shade critters Flamingo Go-Go Rashguard Set. Two-piece swim set in a brightly hued and ruffled design. Swim fabric: &amp#8226 Lightweight knit provides quick-dry, stretch performance. &amp#8226 UPF 50 fabrication protects your skin during outdoor activity by blocking 98 percent of harmful Ultraviolet A and Ultraviolet B rays (UVA and UVB). &amp#8226 Zig-zag stitching prevents bunching at the seams. Top: Rashguard top in a lightly fitted silhouette. Kissing flamingo print accents the front. Mock neck with back zip and zipper garage. Stand collar. Long sleeves with tiered ruffles at the shoulders. Straight hemline. Bottoms: Bikini bottoms feature bunches of ruffles for a tutu silhouette. Elastic waistband. Full rear coverage. Fully lined. Body: 85 percent polyester, 15 percent spandex Lining: 84 percent nylon, 16 percent spandex. Hand wash, line dry. Imported. Measurements: Length: 15 in Front Rise: 6 in Back Rise: 7 in Product measurements were taken using size 18-24 Months. Please note that measurements may vary by size. If you~re not fully satisfied with your purchase, you are welcome to return any unworn and unwashed items with tags intact and original packaging included. Your little swimmer will flourish with a liberal application of sunshine and water. Send her out to the surf to thrive in the retro cool of the shade critters Botanical Rashguard Set. 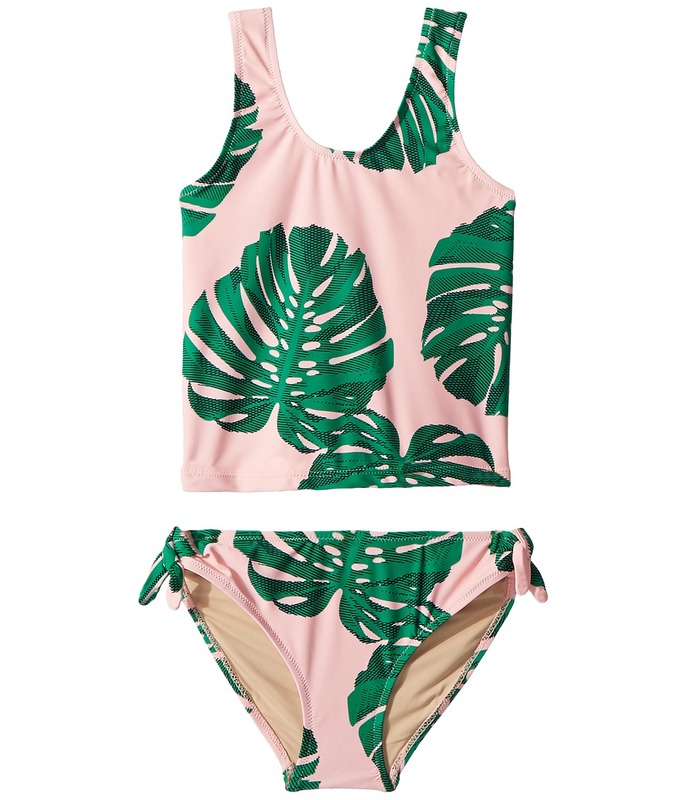 Two-piece swim set boasts a stylish, tropical fern design in an allover print. Swim fabric: &amp#8226 Lightweight knit provides quick-dry, stretch performance. &amp#8226 UPF 50 fabrication protects your skin during outdoor activity by blocking 98 percent of harmful Ultraviolet A and Ultraviolet B rays (UVA and UVB). &amp#8226 Zig-zag stitching prevents bunching at the seams. Top: Rashguard top in a lightly fitted silhouette. Mock neck with back zip and zipper garage. Long sleeves. Straight hemline. Bottoms: Bikini bottoms feature a ruffled waist with coral-hued pom-pom trim. Elastic waistband. Full rear coverage. Fully lined. Body: 80 percent nylon, 20 percent spandex Lining: 84 percent nylon, 16 percent spandex. Hand wash, line dry. Imported. Measurements: Length: 14 in Front Rise: 6 in Back Rise: 6 1 2 in Product measurements were taken using size 18-24 Months. Please note that measurements may vary by size. If you~re not fully satisfied with your purchase, you are welcome to return any unworn and unwashed items with tags intact and original packaging included. From sea to shore, the shade critters Mermaid Rashguard Set has everything your little one needs for their next aquatic adventure! Two-piece swim set crafted from lightweight-stretch fabric for all-day comfort and mobility. UPF 50+ fabrication protects skin by blocking harmful Ultraviolet A B rays (UVA/UVB). Flatlock seams reduce chafing and irritation. Top : Stand collar for additional coverage. Long sleeves. Zip closure with zipper garage in back. Straight hemline. Bottom : Elastic waistband. 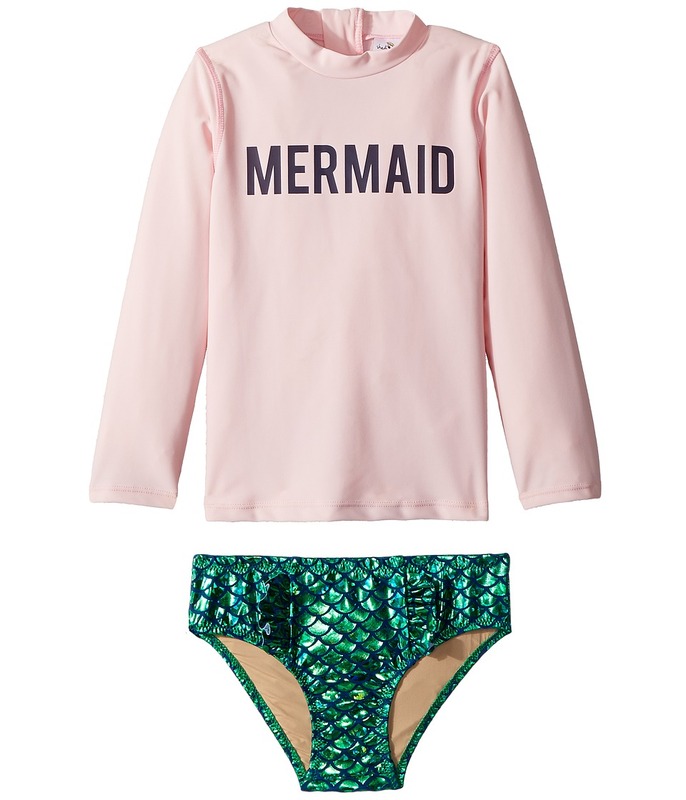 Allover-mermaid print. Info : Top: 80 percent nylon, 20 percent spandex Bottom: 85 percent polyester, 15 percent spandex Lining (Both): 84 percent nylon, 16 percent spandex. Hand wash, line dry. Imported. Measurements: Length: 16 in Front Rise: 7 in Back Rise: 8 in Product measurements were taken using size 4T (Toddler). Please note that measurements may vary by size. If you~re not fully satisfied with your purchase, you are welcome to return any unworn and unwashed items with tags intact and original packaging included. Unicorns are real and they love the beach. 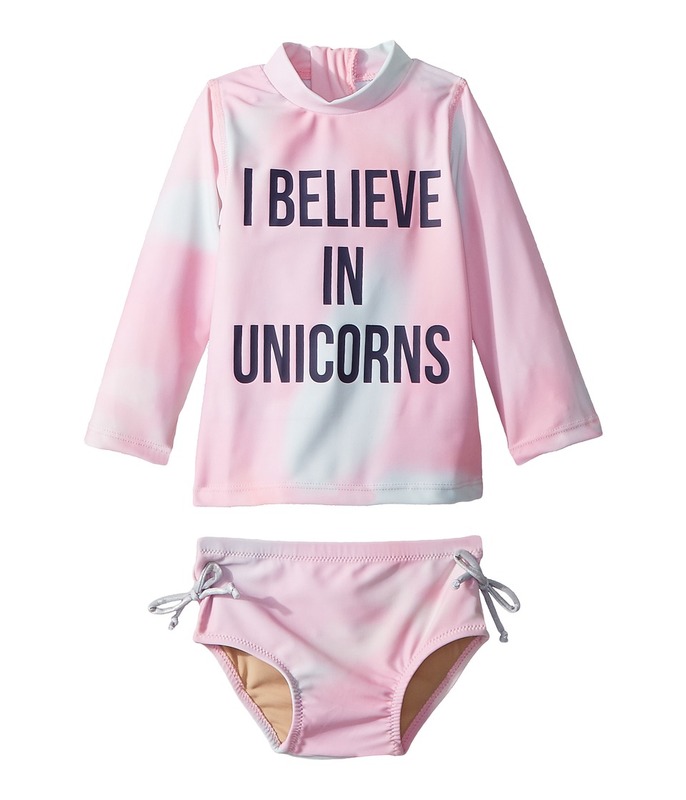 Get out there and catch a legend in the shade critters I Believe in Unicorns Rashguard Set. Two-piece swim set in an allover, rainbow tie-dye design. Swim fabric: &amp#8226 Lightweight knit provides quick-dry, stretch performance. &amp#8226 UPF 50 fabrication protects your skin during outdoor activity by blocking 98 percent of harmful Ultraviolet A and Ultraviolet B rays (UVA and UVB). &amp#8226 Zig-zag stitching prevents bunching at the seams. Top: Rashguard top in a lightly fitted silhouette. I BELIEVE IN UNICORNS text print across the front. Mock neck with back zip and zipper garage. Long sleeves. Straight hemline. Bottoms: Bikini bottoms feature a high-waist silhouette with metallic faux ties at the hips. Elastic waistband. Full rear coverage. Fully lined. Body: 85 percent polyester, 15 percent spandex Lining: 84 percent nylon, 16 percent spandex. Hand wash, line dry. Imported. Measurements: Length: 126 in Front Rise: 6 in Back Rise: 6 in Product measurements were taken using size 6-12 Months. Please note that measurements may vary by size. If you~re not fully satisfied with your purchase, you are welcome to return any unworn and unwashed items with tags intact and original packaging included. Your little swimmer will flourish with a liberal application of sunshine and water. Send her out to the surf to thrive in the retro cool of the shade critters Botanical Tankini Set. 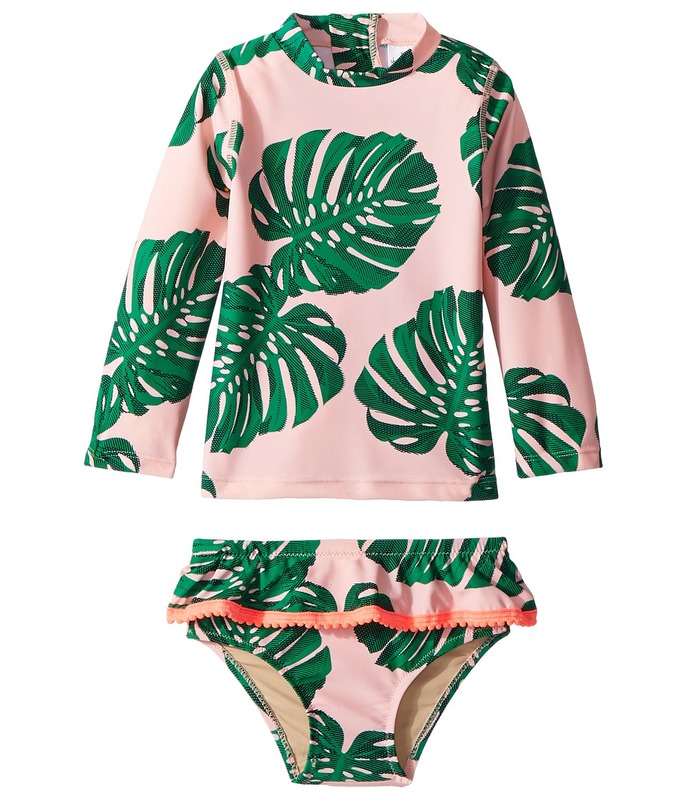 Two-piece swim set boasts a stylish, tropical fern design in an allover print. Swim fabric: &amp#8226 Lightweight knit provides quick-dry, stretch performance. &amp#8226 UPF 50 fabrication protects your skin during outdoor activity by blocking 98 percent of harmful Ultraviolet A and Ultraviolet B rays (UVA and UVB). &amp#8226 Zig-zag stitching prevents bunching at the seams. Top: Tankini top in a lightly fitted silhouette. Wide shoulder straps. Scoop neck and back. Straight hemline. Bottoms: Bikini bottoms feature faux tie details at the hips. Elastic waistband. Full rear coverage. Fully lined. Body: 80 percent nylon, 20 percent spandex Lining: 84 percent nylon, 16 percent spandex. Hand wash, line dry. Imported. Measurements: Length: 14 1 2 in Front Rise: 7 in Back Rise: 7 in Product measurements were taken using size 7 Years. Please note that measurements may vary by size. If you~re not fully satisfied with your purchase, you are welcome to return any unworn and unwashed items with tags intact and original packaging included. It doesn~t have to be the Fourth of July to set it off! Add a little American cool to your swim style with theshade critters Stars N Stripes Tankini Set. Two-piece swim set layers metallic stars over narrow, horizontal stripes. Swim fabric: &amp#8226 Lightweight knit provides quick-dry, stretch performance. &amp#8226 UPF 50 fabrication protects your skin during outdoor activity by blocking 98 percent of harmful Ultraviolet A and Ultraviolet B rays (UVA and UVB). &amp#8226 Zig-zag stitching prevents bunching at the seams. Top: Tankini top in a lightly fitted silhouette. Wide shoulder straps. Scoop neck and back. Straight hemline. Bottoms: Bikini bottoms feature faux tie details at the hips. Elastic waistband. Full rear coverage. Fully lined. Body: 80 percent nylon, 20 percent spandex Lining: 84 percent nylon, 16 percent spandex. Hand wash, line dry. Imported. Measurements: Length: 13 1 2 in Front Rise: 7 in Back Rise: 7 in Product measurements were taken using size 7 Years. Please note that measurements may vary by size. If you~re not fully satisfied with your purchase, you are welcome to return any unworn and unwashed items with tags intact and original packaging included. The shade critters Tie-Dye Tankini Set has the perfect touch of Boho chic for your beach-bound jetsetter. Two-piece swim set boasts an indigo-hued, allover tie-dye print. Swim fabric: &amp#8226 Lightweight knit provides quick-dry, stretch performance. &amp#8226 UPF 50 fabrication protects your skin during outdoor activity by blocking 98 percent of harmful Ultraviolet A and Ultraviolet B rays (UVA and UVB). &amp#8226 Zig-zag stitching prevents bunching at the seams. Top: Tankini top in a lightly fitted silhouette. Wide shoulder straps. Scoop neck and back. Straight hemline. Bottoms: Bikini bottoms feature faux tie details at the hips. Elastic waistband. Full rear coverage. Fully lined. Body: 80 percent nylon, 20 percent spandex Lining: 84 percent nylon, 16 percent spandex. Hand wash, line dry. Imported. Measurements: Length: 15 in Front Rise: 7 in Back Rise: 7 in Product measurements were taken using size 8 Years. Please note that measurements may vary by size. If you~re not fully satisfied with your purchase, you are welcome to return any unworn and unwashed items with tags intact and original packaging included. Your little swimmer will flourish with a liberal application of sunshine and water. Send her out to the surf to thrive in the retro cool of the shade critters Botanical One-Piece. 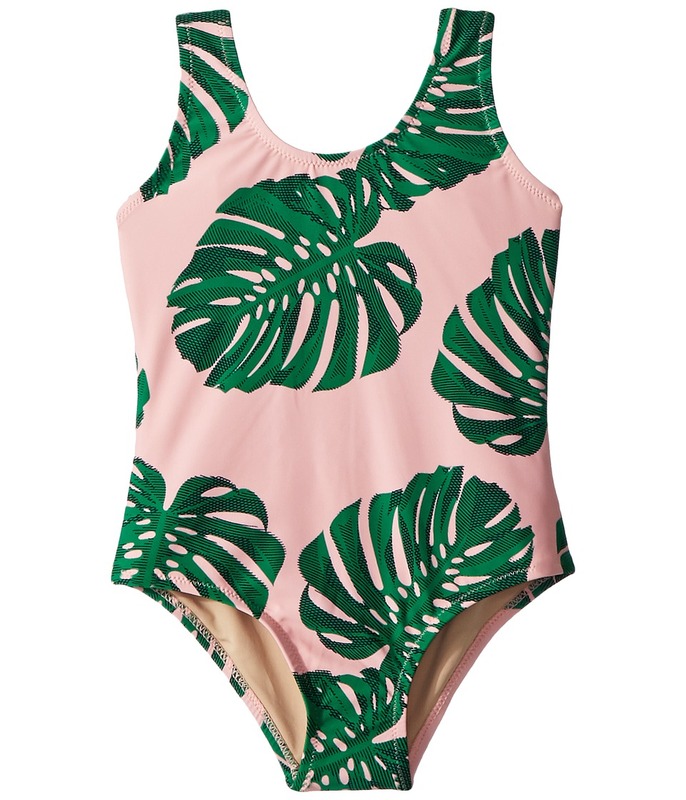 One-piece swimsuit boasts a stylish, tropical fern design in an allover print. Swim fabric: &amp#8226 Lightweight knit provides quick-dry, stretch performance. &amp#8226 UPF 50 fabrication protects your skin during outdoor activity by blocking 98 percent of harmful Ultraviolet A and Ultraviolet B rays (UVA and UVB). &amp#8226 Zig-zag stitching prevents bunching at the seams. Wide shoulder straps with fixed, cross-back strap. Scoop neck and deep scoop back with ruffled fringe. Full rear coverage. Fully lined. 85 percent polyester, 15 percent spandex Lining: 84 percent nylon, 16 percent spandex. Hand wash, line dry. Imported. Measurements: One Piece Length: 18 in Product measurements were taken using size 4T (Toddler). Please note that measurements may vary by size. If you~re not fully satisfied with your purchase, you are welcome to return any unworn and unwashed items with tags intact and original packaging included. She was born for the beach and nobody can question it when she shows up in the shade critters Mermaid One-Piece Scoop One-Piece. 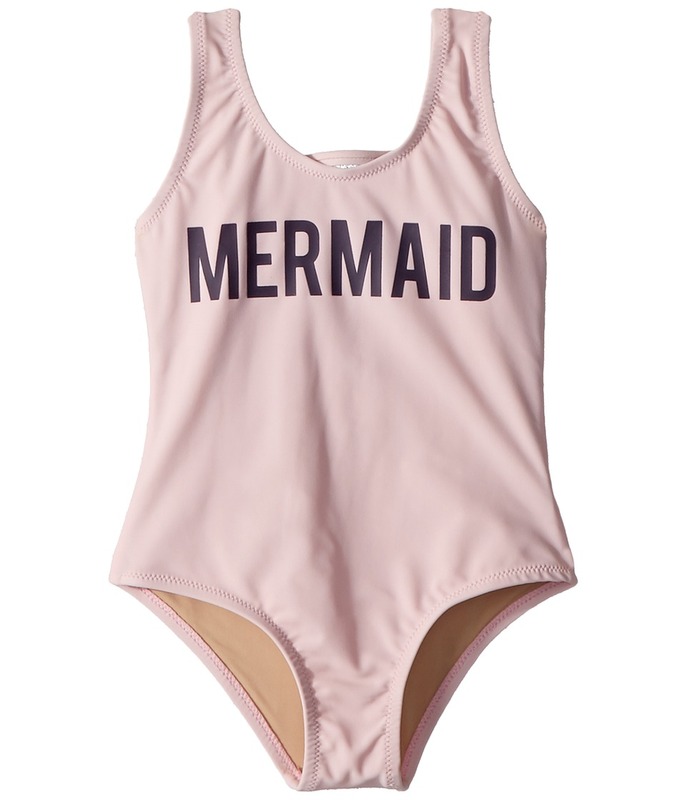 One-piece swimsuit with a simple MERMAID text print across the front. Swim fabric: &amp#8226 Lightweight knit provides quick-dry, stretch performance. &amp#8226 UPF 50 fabrication protects your skin during outdoor activity by blocking 98 percent of harmful Ultraviolet A and Ultraviolet B rays (UVA and UVB). &amp#8226 Zig-zag stitching prevents bunching at the seams. Wide shoulder straps with fixed, cross-back strap. Scoop neck and deep scoop back. Full rear coverage. Fully lined. 85 percent polyester, 15 percent spandex Lining: 84 percent nylon, 16 percent spandex. Hand wash, line dry. Imported. Measurements: One Piece Length: 16 in Product measurements were taken using size 2T (Toddler). Please note that measurements may vary by size. If you~re not fully satisfied with your purchase, you are welcome to return any unworn and unwashed items with tags intact and original packaging included.